Tag Archives for " Nayomi Chibana "
Visual storytelling is one of the most potent forms of communication in existence today. From films and virtual reality experiences to interactive games and data visualizations, visual stories are revolutionizing the way we persuade audiences with our messages. While brands and marketers have generally lagged behind filmmakers and the media in the visual storytelling department, this is rapidly becoming a thing of the past as marketing shifts from “interrupting what people are interested into becoming what people are interested in,” in the words of Marriott’s VP of content marketing, David Beebe. As the Internet of Things and wearable tech take us closer to a perpetually connected world, visual storytelling will be all around us. From having conversations with our favorite characters to playing games that will help feed the homeless, these visual storytelling trends will allow us to live within stories of our making and, in the process, blur the lines between reality and fiction. Audiences’ appetites for captivating stories is growing insatiable–so much so that they don’t want to see them end. Just take a look at the recent trend in rebooting classic movies and hit TV shows and the nostalgia that leads movie studios to make a profit off of these–even if they’re rarely as good as the original. In line with this demand, visual stories will increasingly run parallel to our real lives. This means that stories will not only occur in real-time, they will also happen 24 hours a day, 7 days a week. This means that if you tune into one of these story worlds in the middle of the night, you may find that your favorite character is tossing and turning or staying up late to catch up on some work. Or in the middle of your lunch, you might receive a notification from this parallel story world stating that your character’s town is under a tornado watch. In fact, we’re already seeing this trend taking shape on social media. 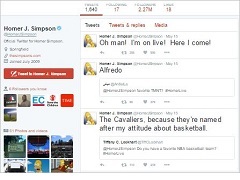 On Twitter, for example, you’ll find Mad Men’s Don Draper tweeting regularly to his 18,000 followers and Homer Simpson amusing his 2.27 million followers. The growth in popularity of live-streaming apps such as Periscope and Meerkat, which allow audiences to interact with personalities in real-time, is another indicator of this trend. The future of visual storytelling will not only follow a 24/7 cycle; it will also appear more real than reality itself. I call this trend hyperreal storytelling, and it refers to the way technologies such as virtual and augmented reality are allowing us to create immersive stories that appeal to several of the five senses. Some of these experiences are so authentic that they have the power to fool the mind and body into reacting as if living through the real thing. Patients with post-traumatic stress disorder, for example, have already benefited from therapeutic virtual reality sessions that place them in lifelike but controlled situations, fooling their bodies into registering these as positive “experiences” in which they conquered their fears. Audiences who grew up with the Internet don’t only crave interactive experiences–rather than passive spectatorship–they also want to connect with other people, whether real or fictitious. Three-dimensional, relatable characters have always been at the heart of the most beloved stories, but in the future of storytelling, it won’t be enough for us to connect with characters emotionally–we must also be able to walk a mile in their shoes. In the VR experience called “Nerve,” for example, users can put themselves in a movie character’s shoes and experience what it’s like to ride a skateboard while holding onto a police car or climbing a ladder from one high-rise to another. Or in the Project Syria experience, viewers can feel what it’s like to live in a Syrian refugee camp and sit alongside grieving families as they hear deafening gunfire and rockets overhead. Related to the previous trend, visual storytelling of the future will also be used to increase empathy for others and raise funds for social causes. Just like Project Syria, there are already dozens of VR experiences that aim to increase awareness of the plight of those who are less fortunate. From living as a homeless person to suffering from Parkinson’s disease, these VR experiences are paving the way for storytelling that has an actual impact on the real world. There are also social games that are used to raise funds for different causes, such as this initiative which urges participants to become real heroes by playing a game that will help raise money for a children’s hospital. When it comes to crafting unique virtual reality experiences, brands are not far behind filmmakers. 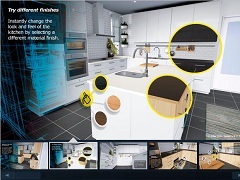 IKEA, for example, launched this VR experience that allows users to walk around and interact with a virtual kitchen. They can open drawers, move objects, change the look and feel of the kitchen and even explore the space from the point of view of a child. Always the content marketing trendsetter, Red Bull also created this immersive flying experience which allows participants to enjoy a wild, realistic air race simulation. Although most of us will not be able to assign millions of dollars to the creation of a VR experience just yet, the trend is clear: The stories of the future will not only become more visual, they will empower us to communicate more vividly than ever through alternate worlds and characters so believable they will blur the lines between fact and fiction, between natural realities and invented ones. Nayomi Chibana is a journalist and writer for Visme’s Visual Learning Center. She has an M.A. in Journalism and Media from the University of Hamburg in Germany and was an editor of a leading Latin American political investigative magazine for several years. She is particularly passionate about researching trends in transmedia storytelling.